I had a bunch of these UKRD brand dinosaurs as a kid. I had more of them, but they're probably all in the roof at my dad's house. These were really solid little guys made from a rubbery plastic, and stood up to years of play. I loved them. The very best one was the pachycephalosaurus - I'd line all the dinosaurs up in a row and then use the pachy to knock them all down like dominoes. It was awesome! Apparently they are still being made too - maybe I can still get the ones I was missing - I didn't have the raptor or the stegosaurus. 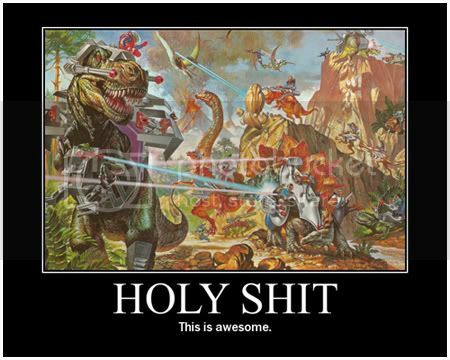 And then there are these awesome dinosaurs. I had that T-Rex since I was 3, my granny gave it to me. I used to be afraid of getting amnesia, and I had that bit of information as my test to see if I had amnesia or not. If I ever bumped my head, I'd try to remember who gave me that dino - if I couldn't remember, I had amnesia! OH NO! 'Course, I still remember, so I obviously don't have any amnesia. Kind of funny though, because if I did have amnesia I probably wouldn't have remembered to try remembering who gave me the dinosaur. And they still make him too! I saw him last week at K-Mart! Wowie! The purple brachiosaurus was one of my favorites. It seems like all the purple dinosaurs I got were favorites. I had two of the purple triceratops, but I have no idea where the other one is, probably wherever the rest of my dinos went. I'm missing heaps. The allosaurus there is awesome, I bought him just recently at a market because of how cool he is. The horrible dimetrodon in the background seems to have a common style in dino toys, I've seen a bunch with the same leg/body/mouth structure only with different 'accessories'. I had one which was a stegosaurus. Another one of those missing dinos. These were given to me from one of mum's friends that went to the british museum. I was told they were very special because they came from overseas and nobody else at school will have any like them. What I wasn't told was that glyptodon isn't actually a dino, he's a prehistoric mammal - Dan pointed it out, lol. I was puzzled about his fur for ages, I couldn't work out why a dinosaur would have fur. I heard about dinos having feathers much later and assumed it was a bad attempt at putting a feather texture on him. Him being a mammal sure explains a lot! I got the blue dinosaur money bank first, then dad decided I didn't think long-necks were cool, so he bought the other one to make up for the mistake. I never used them as money banks, and I never liked the second one. I guess he looks silly and cheesy in a likable way now, but back then he was a massive dissappointment, lol. Here are my dino brites, and my lonely dino mite. I always liked the T-Rex best, he just has this crazy grin that makes him awesome. I got this mug at the zoo when a dinosaur animatronics display was there - it was awesome! The dinosaurs looked really good, and they popped out of the bushes and scared people, it was cool. They had some in the animal cages, the bigger displays, like one where a dinosaur was getting eaten by some other dinosaurs, that was cool. Anyway, the top comes off so you can put liquid in, then you put it back on and theres a hole in his head for a straw to go in. These two are battery powered! The T.Rex roars when he's moved, although the slightest tap used to set him off. I have a funny feeling dad pulled him apart when I wasn't around and broke his roaring mechanism because it was annoying though. He stopped making noise one day, and on that same day his tail got really loose and his insides started rattling inside like they had come apart. The bronotosaurus walks and makes noises, and it's eyes light up! Actually I think the other one's did too, but I don't remember. These suckers are made out of really soft rubbery plastic, it attracts dust like crazy. I think I got them at a school fair where some kids were selling off toys they didn't want anymore, so I have no idea as to the real origin of these. They seem a little too nice to just be generic chinese party goods. Particularly seeing as they can be used as finger puppets or as regular toys - it seems rare that anyone thinks to add that kind of functionality to finger puppets unless they're also making them expensive, lol. Jurassic park dinos! Both are kind of broken though. They used to have chomping actions when either an arm or a leg were moved, but only the raptor still does it. They also used to make noises I think, and neither of them do that anymore. And what's a dino collection without a few dinos you can cuddle? I used to love that brown stegosaur as a kid, I was really careful not to get him dirty, or let any other kids play with him. He was precious! The others are newer additions, in particular the psychadelic one - I just couldn't say no to something as crazy as that for 50c. Notables from my collection I'm missing include a large JP brachiosaur plush toy with a bendable wire supported neck, a big pachysephalosaurus doll which came with a real piece of dinosaur bone, and I'm sure I had more dino brites and UKRD dinos. Edited by Airot, 03 January 2009 - 12:26 AM. Edit; I just realised I forgot to include this pic, so I'll add it now. The triceratops is marked 'mcdonalds', the green chunky guy in the back contained powdered candy, the Dino also contained candy and I got him when dad decided to go on a long drive lat lasted a day or two. The little stamp guy was part of a set, but the others are missing, and so is the rubber part of the stamp! Oh no! Edited by Airot, 03 January 2009 - 05:09 AM. Awesome images you've shared, and probably more of a topic-starter than the UKRD stuff alone, I'd agree. I'm not actually a fan of the larger UKRD ones for some reason. Their wrinkly skin bothered me or something, I dunno. But I did collect the "baby" versions and have at least half of the full set (your green sauropod is one of them). I've seen them released in multiple ways in the past few years. The way I first got mine was through an actual English-language candy toyline that featured multiple different promotions, which was strange considering I now associate that with Japanese toys. This was maybe ten years ago, so I can't remember any details, sadly. I see them most often now in museums, usually in those funny dinosaur tubes. Your second pic features mostly Imperial dinosaurs, and the logo should be somewhere on their stomachs, tails, or feet. And that's their thing, releasing over and over the same dinosaur molds, barely untouched. I have a few, but never did get their T. rex. The British Museum line is a childhood favorite, even with the lack of paint in the older versions. I used to have their mammoth, while my brother had the Muttaburrasaurus and your glyptodon. Also just a coincidence, but I used to have that very same roaring T. rex! The curled end of its tail broke off, and eventually it got junked after being ruined in a hurricane. And man, did it hurt whenever I dropped that sucker on myself. Oh, and your Jurassic Park toys are cool, but that's not the electronic roaring Raptor. The one that roars cannot move its head or neck, and the head is frozen in a roaring pose unlike the Spitter. Its gimmick was moving arms instead. I know as it's the only electronic JP dino I ever got. If I had the Spitter too, then I'd have had all the basic dinosaurs from the first wave of the movie, even if I never did get the cool, bigger guys. I thought some of those were imperial dinos - but mine don't have the imperial marking on them, I've checked a few times, just to be sure, lol. The t.rex has 'made in china' on his tummy but nothing else. The stegosaur has nothing on him at all. The triceratops has 'China 1987' on him. Real helpful, eh? Maybe it was the spitter that roared then... or another toy entirely, my childhood memory is pretty fuzzy at times, lol. I got them backwards anyway, the raptor is the one that doesn't move his head anymore. I used to have the dimetrodon too, but he's one of the lost ones. And the UKRD guys - they had some teeny tiny ones too - little little guys, I had some of those. They came in vending machines, and I got some at a carnival of some kind. My sister kept telling me there was a ghost that tried to grab me when we went on the ghost train - she was trying to scare me, but it didn't occur to me that ghosts are scary at the time so it didn't work. I wasn't exactly sharp, was I? I was going to give him my spare stegosaurus, lol. Anyway, I found out from dinosaurcollector.com or .org or something like that, that those dinosaurs were also UKRD. I didn't have many of the medium ones like the green apatosaurus, I wanted them though. I liked the colours more, lol. I hated the bland and boring colours of the bigger guys. They just weren't that attractive, but the texture was nicer than most of my plastic dinos and they looked more real, so I liked them better anyway. And that roaring t.rex is pretty pointy, huh? I never managed to drop him on myself but I dropped him on my dad once and got a pretty awesome reaction; who the hell says 'YOWZA'? great collection of dinosaurs. makes me wish i still had all the ones my dad got me from dinosaurland and various other tourist traps. I had a box ambiguously labelled 'BAARBEES' and another more clearly labelled 'PONIES'. Gotta love the elderly and their constant struggle for order. My granny was the kind of person that labelled bi-carb soda as 'bicarbonate of soda' in fancy flowery script on the side of whatever jar she put it in. Me? I leave it in the box it came in. But if I did label it, I'd just label it 'bi-carb'. How many other things are going to be in my kitchen with that name? That was where my bigger UKRD guys were - I honestly had forgotten them entirely until I got the box open! And there was a pink and yellow imperial sauropod with 'imperial' stamped on his belly, unlike my other imperial dinos. And I can't believe how good some of my ponies look after all that time I spent playing with them in dirt and mud. It's madness! Anyway, I threw in my UKRD pachy to show the size differences here. I really ought to just get a ruler, lol. The barbies box was less exciting because I had to pull everything out before I got to the better part of the box, the part with a few little 'safari' branded dinos and a bendable UKRD guy with a broken leg and tail. There was also a bright blue pachysephalosaurus. And this is my hat. It's relevant, I swear! found some dino goodness on ebay. just missed this lot of british museum sculpts. too bad the mammoths are both messed up. because i can't get enough of shizznit that comes from an egg, here's several lots of dinoegg goodies. 12 hatching dinosaur eggs. 6 growing pet hatchers. 4 jumbo hatchers. glow in the dark dino skeletons, the packaging looks like an egg okay. 36 mini-dino eggs. here's a concept like the egg hatchers, it's just a volcano that erupts instead of an egg. nice big lot of various dinosaurs. another lot with goodness, not to mention the two headed dragon mount. one of my faves from childhood. i can't remember who had these marx caveman & dinosaur plastic toys. they're pretty damn cool too. Hey! I got one of those 12 growing egg dinos - it wasn't very impressive... then my cat nicked it. Now I have no idea where it is. The guy who was selling them lead me to believe that when you remove them from the water they retain their size increase, but it was just as big a lie as it sounded like because he shrunk all the way back down as he dried out. And those 6 windup dinos, in one of my pictures there should be one of those, a t.rex. I think I recall taking his photo with a windup sauropod. And that big lot has some really cool guys in it, pity postage would probably be A MILLION DOLLARS. There really is origami of dinos though - I should go buy some origami paper to increase my collection! Edit; hey isn't that a pink mimp dino in the middle of that big lot? Edited by Airot, 03 January 2009 - 09:26 PM. Wonderful collection there, they all looked really familiar to me, so I had a peek in my dad's attic, and I have around 90% of your ones myself, plus others! Suppose it's the best thing to be dino-crazy as a youngster, that way everyone knows what to get you for birthdays and Xmases. Lots of dinosaurs! I yearn for a camera, when I get one, my collection will go up. Worst thing was that I liked ponies and dinosaurs but people still bought me dolls because that's what you buy girls. I had an entire drawer full of barbies, and I never played with them. Well, other than to remove the clothes and swap their heads around. I'm sure a barbie is more expensive than a dinosaur, maybe not a my little pony, but if they wanted to buy me expensive girly gifts they could have got me ponies. Jerks. If only I could find the rest of my dinosaurs! And please do post your collection! We can all be dinosaur nuts together I'd lend you my camera, but you kind of live very far away, lol. ... I had an entire drawer full of barbies, and I never played with them. Well, other than to remove the clothes and swap their heads around. I thought to myself; hey those look like they might be kinda cool! They can fit 8 dinosaurs into that box so they must be pretty tightly packed in there, and the price tells me they must be pretty detailed and nicely painted too. The box is pretty nice looking all by itself, so the guys inside must be awesome. The selection of dinosaurs printed on the back of the package was good as well - there were several different sets I could choose from, although the dinosaurs in each set were grouped by body shape - bipedal, quadrupedal, long necked quadrupeds, and another bipedal/quadrupedal crossover set. Most unfortunately of all the little cases are closed in the packaging and you can't see the guys inside. I should have twigged that that meant something bad. And was I ever disappointed. They were absolutely tiny (I could stuff about 20 of those little guys in there, no problem! ), monocoloured and the detail. With figures so little even the smallest mistake in the sculpting becomes massive, and even the smallest ammount of flash or a tiny moulding defect stands out like crazy. They also come on ugly stands with their names printed on - hard to read names that is. I couldn't tell if it was meant to say mamenOhisaurus or mamenChisaurus D: google is my friend though, it tells me it's a C.
You can't take them off the stands because they have bizzaro deformity feet so that they peg onto the stands and don't fall off. 'Course one was already falling off when I opened it and I had to put him back on his stand or bear the sight of those ugly feets. Oh, and they won't stand up because the peg deformities aren't on all the feet, I'd have to CUT THEM OFF. A lot of the detail on these guys is sort of bluffed too. Take a good look at the amargasaurus. The body is so-so. Passable but not for $1.60 a figure. For a cheaper toy it would be just fine. The NECK however... just wtf is that supposed to be? a stretched out jelly baby? YUCK. And wait, isn't amargasaurus supposed to have TWO rows of spines down it's neck? There's only one there! I checked wikipedia, I'm right, there should be two rows! Finally, I'll throw in this pic with a mimp for size comparison. Just so you can see how itsy bitsy these fellas are. I know those big close up photos can be very deceiving. For those that don't know how big a mimp is... measuring from the highest point on the figure to the table (including the stand) the gallimimus is the tallest one there, it's 3cm tall. Without the stand it's about 2.6cm tall. The shortest is apatosaurus at 1.5cm with stand and 1cm without. The longest is mamenchisaurus at 3.9cm, the shortest, brachiosaur at just over 3cm. It seems that the general rule of thumb for these guys is that the measurement from toe to the peak of the arch on the back has to be roughly 1cm (excluding gallimimus) and then the head and tail can add on any extra height. I kind of like these guys, they're sort of cute. I just think the price is utterly ridiculous. Maybe $8 max for the set. That would be okay, but I'd still have trouble agreeing to hand over my hard earned cash for it. I'd have to justify it over and over in my head as paying for the cool box as well as the dudes inside. And then I'd have to have something to put in the box other than dinosaurs so it was worth it. $6 for the set would be fine, especially if they jazzed it up by calling it '$5.99'. But $13? What on earth were they thinking? As if any parent is going to fork out that much money for something so tiny and generic if they knew what it was! Kids would be pretty disappointed too. Sure brand name stuff can command high prices. Pokemon, Ben 10, Bakugan. But dinosaurs? Most people are used to buying brightly coloured dinosaurs in a big bag for $2. Hell, I could have bought six and a half 3-4" tall 6-8" long dinosaurs from a bin in the shop next door for that price. But noooo, I had to buy eight teeny tiny dinosaurs because I'm a sucker, lol. I tried looking up marketing shots on the internet, but the marketing shots don't really allow you to see the scale of these guys. To see what I mean, check out the official Dino Horizons site. Enter the flash page, select 'dino collection' from the sidebar and it should be the first product to appear. The image is a photoshop generated collage that makes the dinosaurs appear much larger than they are. If they were really that big it would be tough to fit more than 4 per case. The fact you can't see how big they are before buying a pack and the fact there aren't any measurements on the pack also make it seem as if they are deliberately trying to trick people. Oh, and sorry about my switch between metric and imperial measurements, my ruler only had metric, and I measure things visually better in imperial. Edited by Airot, 06 January 2009 - 03:36 AM. Man, I had a number of those dinosaur figures in your photos back in the day. That plastic T-rex in grey with the brown highlights was given to me on like my fifth birthday and I held onto it 'til a couple of years ago when I had a major posession clear out. Prior to that it was the most constant posession in my life. And those Jurassic Park figures! They were awesome. I got a whole bunch of them in about '94 when the J.P. toys were all severely marked down - I had that Raptor, the screaming Dilophosaur, the water-squirting Dilophosaur and a Dimetrodon. The Dimetrodon was probably the best Dimetrodon figure I have ever seen, it was done in bright greens and it had a nifty mechanism whereby pressing its hind leg made it's mouth open. ...I got a bunch of MIMP dinosaur figures in an eBay lot the other day and they really are pretty cool sculpts. The Kentrosaurus is a really handsome figure and I wouldn't mind getting a Triceratops too as he looks pretty badarse. You know, I believe I forgot to take a photo of my mimp dinos for this dino thread. I have rectified that with this poor shot in bad light because it's dark and cold outside. Which shot was the grey t.rex in? Is he the lil' safari guy? The JP dimetrodon was pretty cool. It had a big chunk eaten out of it's side though, with bones and stuff showing through and as a kid I thouhgt that was really gross and it seemed deep enough to be fatal, so how could I play with him if he was dying? I didn't like to play with him much at all... unless he was on the losing end of a fight, and then it was okay because he already had the appropriate wounds, lol. One of my friends got a hold of him one day and drew 'blood' on with crayons, I never played with him at all after that. I couldn't stand it if my toys were defiled by other people, lol. I think I only got those three and a JP soft toy brachiosaur. I din't remember having any other JP toys. My memory is pretty fuzzy so I remembered things having the JP symbol on them that didn't when I found them, like this big pachycephalosaurus doll which I found hidden in one of the cupboards here - he must have come with me when I moved, but I don't remember bringing him. Edited by Airot, 06 January 2009 - 02:11 PM. No it didn't. What is it with you and your JP toy memories? That sounds more like the JP3 toys, because those all had damage that was always there and couldn't be removed or hidden. The basic-sized toys didn't have Dino Damage until much later in the original line, closer towards the time of The Lost World and its line (plus some of the originally unreleased "dinosaurs" like Scutosaurus). You are right though, the Dilophosaurus is the electronic version (the only original basic dino I never got). Edited by Boaconda, 06 January 2009 - 02:49 PM. Well, I definately remember him having his ribs showing... But that looks like the same guy. I thought he had a stripy pattern on his sail though. Not spotty. I guess I can vaguely remember spots a little bit. Maybe I got a memory of the advertising for the guys with dino damage mixed up with him? I'm certain one of my friends drew on him though. I didn't speak to her for a week. She was the one who gave him to me too - I think it was my birthday, or maybe she was given him and didn't like him so we swapped toys. She always used to get cool toys, and she never liked them. I thought it was great because I could get rid of my dolls on her and get stuff that was heaps better in return. I miss my lost dinosaur toys! If it's any help, my T-Rex from Jurassic Park has a big gaping hole in his side, showing off the ribs, but you could cover this up with a chunk of flesh. It says 1992 on his foot, so it was clearly made before they knew whether the film was a success or not. Ha! I just picked up an Edmontia Dino Rider figure from Savers in Brunswick for $2! Just the dino though, no weapons. Pics soon. That thing looks awesome, no missing paint, no ugly chew marks or scrapes from playing on concrete... maybe there are some, but it looks like it's in miraculous condition. I love love LOVE Dino Riders... and yet I've never owned one. Do have a couple of the Smithsonian dinosaurs though, Kentrosaurus and Monoclonius. Definitely ranks up there with my Carnegie figures as some of my fave dino toys. I love love LOVE Dino Riders... and yet I've never owned one. Edited by jack cambrian, 09 January 2009 - 01:32 PM. This time it's a 4D Dinosaur Puzzle by 4D Master. I saw this one in the supermarket (again, lol) a few months ago for $6 an egg. I felt that, being a puzzle, the toy would look pretty average. Big seams all over the body, getting in the way of any awesome the toy might have had, probably fall apart at the slightest breeze, probably pretty cheap looking too. So I put off buying it. Honestly, I think I should have bought two of these instead of those bronze midgets. Anyway, I found two today in a discount store, on a clearance table (lol, how cheap do you get? ), for $1. And I nabbed them! THEY WAS MINE. However I opened and assembled the first one without thinking and didn't take any pics. So this is the story of the first one, with pictures of the second one. It all makes sense, I promise! And here's the packaging. It's actually pretty appealing to look at, but that plastic sleeve really could be done without. The label underneath is a pretty tough sticker that keeps the egg container shut, so the plastic sleeve is redundant. There are 4 different egg colours, each corresponding to a different dinosaur. Grey, dark grey (pictured), drab green and desert tan. The label on each egg shows a teeny tiny picture of the dinosaur inside too. After struggling with the plastic sleeve and then that nasty label for a while, I finally pulled open the egg and got to the delicious yolk dinosaur inside. It was in 22 little parts (6 of which had partnered up, and I had to pull them apart because I'm OCD like that). There was also a little bit of paper with instructions and a time sheet for challenging yourself to see how fast you can assemble each dinosaur. This is the lovely little bits! From first impressions, these are made of a much higher quality plastic than I had originally thought, and the skin texture and paint detail was a lot nicer than I expected. A LOT nicer. Putting the bits together, whilst not very challenging, was more entertaining than I had thought too. The bits are connected with pegs of various shapes which go into some unusually shaped holes. It takes a little bit of spatial thinking to work out how to put a few parts together. I'm sure it would be far more challenging to the 6-12 y.o. kids they were targeting with these though. When finished these guys are surprisingly sturdy. And a bit heavy, due to being solid plastic. I think the assembled puzzles would stand up to a decent level of rough play. Unless you were actually attempting to remove a part, it won't fall off - the legs in particular have very unusually shaped pegs so it would be impossible for them to detach unintentionally. The seams between the parts are quite a lot less noticeable than I thought they would be too. And the detail is absolutely lovely, coupled with the virtually immaculate paint jobs, they look very very nice. I honestly think I'm going to have to check out that supermarket again and see if I can get the other two in the set because I really like these, and I'm quite happy to pay $6 for them. Note that this is probably the ugliest photo I could have taken of them. I didn't notice I hadn't put the pentasaurus's shoulders together properly until after the picture, and the t.rex's one paint mistake is on this side. Plus it's night time and bad light does all kinds of bad things. I'll take another one in daylight! I promise! The other two in the set are iguanodon and dilophosaurus, however it seems that there are a few other sets if you take a look at the manufacturer's website. Time for some serious down-tracking! Edited by Airot, 10 January 2009 - 03:52 AM. wow, it really is hard to see the seams on those. i've seen 3d puzzle dinosaurs online but they're so blocky where the seams are they almost look like an 8-bit sprite. these are obviously not the ones i saw. they've got a higher level of detail and apparently they took the time to make sure the pieces fit together in a good way rather than rushing out an inferior product which seems to be the current modus operandi of most companies now days. that 4d masters site is chockfull of greatness too. i'm definitely going to have to be on the lookout for their products. great find and great job. I've seen 3D dinosaur puzzles before, but then I saw the 4D Masters ones too, at one of those higher-end mall science stores, Discovery I think. They are totally awesome, and your pics make me wish I'd bought them years ago. For those of us in the States, I know Amazon has multiple series available if interested.